The 2nd participatory workshop in Litoměřice took place on 31st October 2017. Twelve stakeholders were acquainted with the results of previous workshop and were asked to assess their perception of different types of adaptation measures from different perspectives in the context of possible implementation in Litoměřice. 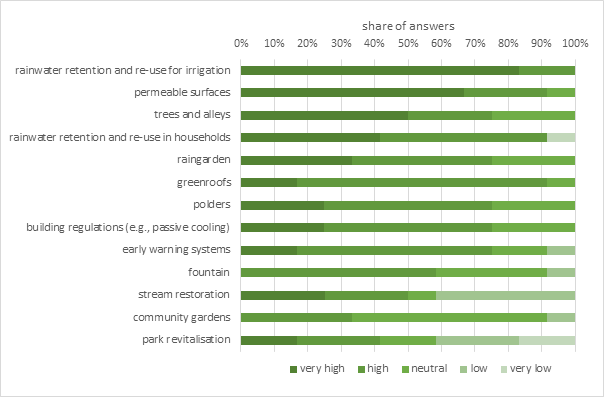 Beside the outher important results, it was shown, that adaptation measures with the highest priority among the stakeholder are: (i) rainwater retention and re-use for irrigation; (ii) permeable surfaces (increasing share), and (iii) trees and alleys (see Fig. 1). Obtained results are to be reflected in adaptation strategy, which is being prepared. Fig. 1. Priority assessment of different types of adaptation measures among the stakeholders in Litoměřice. The 2nd participatory workshop in Ústí nad Labem took place on 1st December 2017. As in Litoměřice, eleven participating stakeholders were acquainted with the results of previous workshop and were asked to assess their perception of different types of adaptation measures from different perspectives in the context of possible implementation in Ústí nad Labem. It was shown, that adaptation measures with highest priority among the stakeholder are: (i) permeable surfaces (increasing share), (ii) trees and alleys, and (iii) rainwater retention and re-use for irrigation (see Fig. 2). 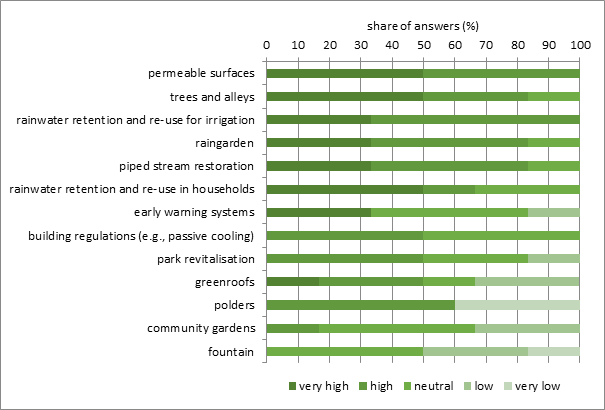 Preferred adaptation measures are similar to those identified by the stakeholders in Litoměřice. Fig. 2. Priority assessment of different types of adaptation measures among the stakeholders in Ústí nad Labem. 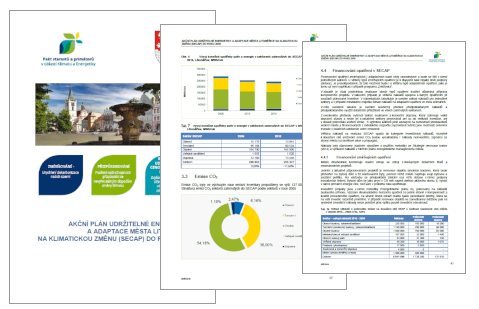 Within the LIFE LOCAL ADAPT project we cooperated with the Litoměřice city council representatives on the development of Sustainable Energy and Climate Action Plan (SECAP) for Litoměřice city. As part of the SECAP plan, Adaptation Strategy of the city has been formulated in close cooperation with LIFE LOCAL ADAPT project. The Adaptation Strategy is focusing on climate change-related problems (such as heatwaves and extreme heat, extreme precipitation and insufficient rainwater retention, floods and drought) and consequent adaptation solutions. The identified adaptation measures focused mainly on use of nature-based solutions as well as technical measures (e.g. buildings adaptation to changing climate). Litoměřice city council approved the SECAP of Litoměřice on 13th September 2018.